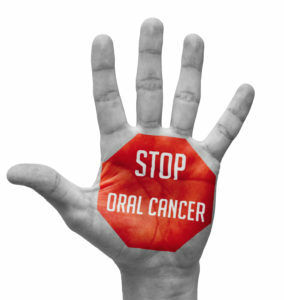 Your Dentist in Mesquite Says Take a Stand Against Oral Cancer! April has been designated as National Oral Cancer Awareness Month. Thus, dentists around the country have joined forces to encourage Americans to get checked for this disease that will affect over 40,000 people this year. Your dentist in Mesquite is doing his part to lower that number by encouraging you to take advantage of preventive care visits, where you’ll receive a full oral cancer screening. Learn more about this disease, its symptoms and how you can be empowered to fight it as you continue reading. Oral cancer is the abnormal growth of mutated cells in your mouth and throat. It can be fatal if not treated and is projected to claim over 10,000 lives in 2018. Mouth – In the mouth, traces of the disease can be found in the lips, cheek lining, teeth, gums, the front two-thirds of the tongue and the roof. Throat – When it enters the throat, oral cancer may be found in the tonsils and on the back of the tongue. Cleaning – Dentists and scientists have found a correlation between bacteria growth, gum disease and oral cancer. Like a chain reaction of events, when bacteria accumulation gets out of control, it causes infection and inflammation. The latter then makes you more susceptible to oral cancer. Thus, when your dentist clears away plaque and tartar, it results in you taking a stand against this disease. Examination – Along with identifying any oral issues, the examination that your dentist will conduct will include a complete oral cancer screening. Thus, if there are any signs of the disease, he’ll be able to advise you on the best treatment measures to address it. Also, by identifying the symptoms earlier, you don’t have to immediately consider the more aggressive methods to eliminate the problem. When it comes to getting your oral cancer screening, keep this old axiom in mind: “An ounce of prevention is worth more than 10 pounds of cure.” To take advantage of this opportunity to protect yourself and enhance your health, reach out to your local dentist today! Patients who visit Dr. Brian McKnight will experience a level of attentiveness, compassion and patience that is unmatched. In his quest to provide the best care, he has completed thousands of hours of continuing education over his career, covering a wide range of modalities. Dr. McKnight can be reached for more information about his services through his website. Comments Off on Your Dentist in Mesquite Says Take a Stand Against Oral Cancer!